The unique location of The Royal Horseguards, tucked away in a quiet area of Whitehall, makes it one of the most sought after hotels in London. Overlooking the Thames it is perfectly, situated for both business and pleasure. Trafalgar Square, the Houses of Parliament, Downing Street and Whitehall are all close by, while Fleet Street, the City and Mayfair are just a short taxi ride away. Offering some of the finest accommodation in London, coupled with a reputation for five star service, each of the 281 spacious air-conditioned rooms has all the facilities one would expect, including CNN & Sky TV, valet and 24 hour room service. A new, fully equipped fitness centre is also available for all guests. Elegant executive and deluxe rooms offer many additional facilities for the business or leisure guest including lavish marble tiled bathrooms and mini bars. Deluxe rooms also feature computer modem and facsimile points and 110 volts American plug power points. Two individually designed, prestigious duplex suites and a self-contained apartments provide spacious and stylish accommodation and include such features as facsimile machine, video recorder and CD music centre. Granby’s Restaurant, elegantly styled in the manner of an English gentlemen’s club. Offers an extensive international menu. Alternatively the 2A Bar is the place to meet your guests for a light lunch, or a drink before dinner. 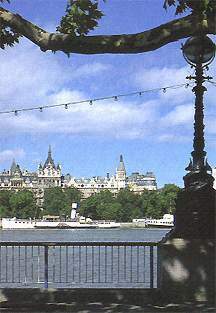 Overlooking Victoria Embankment Garden and the River Thames, The Terrace offers snacks and speciality ice-creams during the summer months. The lounge provides an air of discreet luxury in which to relax and take morning coffee or afternoon tea. 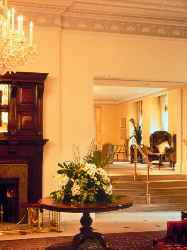 Adjoining The Royal Horseguards is One Whitehall Place, London’s most prestigious conference and banqueting venue. Eight rooms, the largest seating 250, can be used simultaneously for both meetings and banquets. State of the art audio-visual equipment is available and experienced staff are always on hand to assist with the most demanding requirements.